It is even later than usual this time and I'm afraid that this won't get to you till to-morrow night. I am so sorry, but what with Commencement preparations and the last examinations I have been just terribly busy—every minute taken up. Even now Louise and I are going down street in about a quarter of an hour and so I have only time to scribble a tiny little note. But just think I will see you in four days!!! Isn't that almost to grand to believe! Oh, Detty, I get so excited when I think about it. Isn't it just glorious! Be sure to le be down at the station so I can get a glimpse of you—and Margie too. Oh dear, I wish she was going to be at home when I got there, and you too. It will seem so queer for Margie not to be there. But both of you be sure to be there, if you possibly can. The train is supposed to get there about half past eleven but it will probably be an hour or two late. You can find out at the station whether it is or not, can't you. I got both of your all's dear letters this morning. How grand it must be for you to have Margie with you and for her to be there. Oh, I wish some of my family could come down here, sometimes. I can hardly talk about anything but home, so I'm afraid I can't tell you much news. To-night the elocution department gives “Midsummer-nights dream” in the new auditorium. I have seen the dress rehearsal and I think it is going to be perfectly fine. The girls do so well. Our examinations were all over yesterday and to-morrow Commencement begins. sSeveral old A.
K.?s have come back and it is so fine meeting them and being with them. They are perfectly fine. I have spent all this morning working so hard, decorating the studio for the art exhibit which is to-morrow. I have three rather big pictures and two little ones, all framed and beautiful—of course. 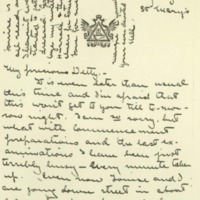 McAdoo, Eleanor Wilson, 1889-1967, “Eleanor Randolph Wilson McAdoo to Jessie Woodrow Wilson Sayre,” 1907 May 28, WWP17400, Jessie Wilson Sayre Correspondence, Woodrow Wilson Presidential Library & Museum, Staunton, Virginia.